Balearic cuisine is a Mediterranean cuisine as cooked in the Balearic Islands, Spain. 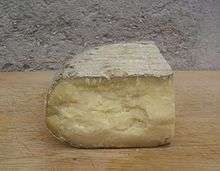 It can be regarded as part of a wider Catalan cuisine, since it shares many dishes and ingredients with Catalonia and the Valencian Community. Others view it as part of a more global Spanish cuisine. Traditional Balearic cuisine is rich in vegetables, cereal and legumes as well as being low in fats. 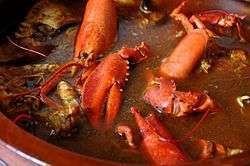 A succinct selection of the primary dishes would be ensaimades, seafood and vegetable stews, sobrassada, coques, tombet, Maó cheese and wine. 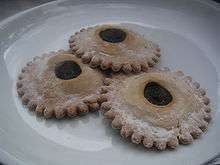 Ensaïmada: Lard- based pastry sprinkled with powdered sugar. Flaó: Cottage cheese tart. The recipe includes eggs, cottage cheese, sugar and mint. The mixture of savoury and sweet flavourings may reflect Arab influence from the Islamic past of the islands. Coca: Similar to Italian pizza but without cheese. Typically, Majorcan varieties include julivert (parsley), pebres torrats (roasted peppers), and trempó (tomato, green pepper and onion salad). Panades: lamb and pea pasties. 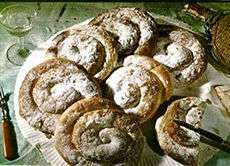 Crespells are a Majorcan kind of biscuits. Tombet: Fried courgettes, potatoes, eggplant and red peppers baked in tomato sauce. Tumbet is related to similar Mediterranean dishes such as samfaina or ratatouille. Trempó: made of pepper, onion and tomato; eat with mussels, in coques, as a salad, etc. Sopes mallorquines: made of vegetables, broth, and bread slices. Arròs brut: "Dirty rice" - meat, vegetables, rice and spices cooked in a meat broth. Arròs de la terra: bulgur with local specialities as botifarró, etc. Mayonnaise: (Is Called All i oli, that means garlic and oil in Catalan) Some historians argue that mayonnaise originates from Mahon (known in native Catalan as Maó), the capital of the Balearic island of Menorca. Red wines from the Binissalem and Plà i Llevant areas. Caragols: Snails are eaten as a stew. It also contains meat, potatoes, and fennel. Snails are also eaten sometimes in paella. Wikimedia Commons has media related to Cuisine of the Balearic Islands. Menorcan cuisine. Recipes of traditional cuisine and gastronomy of Menorca. Discovering Menorca.